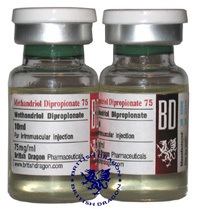 Methandriol Dipropionate is long-acting version of Methandriol produced in injectable and oral forms. It possesses both anabolic and androgenic properties and is intended for bulking and increasing strength, however, it’s not very potent steroid by itself and if possible it’s better to substitute it by other combos, for instance, deca with some testosterone. This is long-acting drug so although ED is possible, but not absolutely necessary. Thus Methandriol could be taken at 100 mg every 3-4 days,75-80 mg/EOD or 40 mg / ED. Length of Methandriol usage within the cycle should not exceed 4-6 weeks because receptors are quickly getting used to it thus require higher dosages. It’s not very potent steroid, however, it stimulates your AR receptors to become more sensitive to other drugs, so it is highly advisable to combine it with some injectable steroids like testosterone. However, some people say this “increased AR sensitiveness” is nothing but myth. Some users refers to it as highly estrogenic drug with respective sides. Water retention is comparable to deca-duraboline. Using of anti-aromatize does not prevent estrogenic problems of Methandriol dipropionate, since it is directly estrogenic, not merely “easy-to-aromatize”. Maybe only Clomiphene (Clomid) can help. Oral form is liver toxic, so do not use it over 4-6 weeks. Other possible sides for oral Methandriol are acne, gastrointestinal pain, possible development of gynecomastia, increased aggressiveness, and high blood pressure. It’s not advised for females due to its androgenic properties.